All roads lead back to the All-Valley Karate Tournament in the new Cobra Kai promo. YouTube Red has been doing an impressive job promoting the new series with 30-second promos and the recently released full-length trailer. Additionally, the promotional campaign has extended to billboards and other physical outlets as well with some pretty unique ways to interact. If that wasn't enough, there's going to be a world premiere where you can watch the first two episodes of Cobra Kai along with the The Karate Kid. 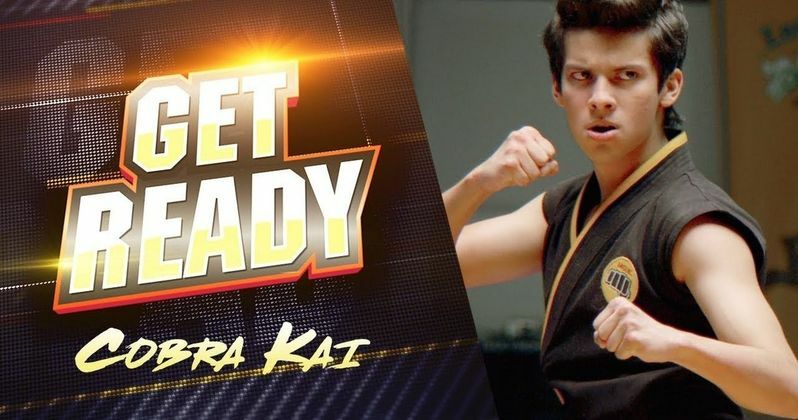 The new 30-second promo features a commercial for the All-Valley Karate Tournament and promises us that old rivalries will be sparked up again, which is something that fans have been waiting for since Cobra Kai was announced. Johnny Lawrence is back training a new team of Cobra Kai and they've taken his teachings very seriously as evidenced by the new promo. Daniel LaRusso seems hesitant to bring back his fighting that Mr. Miyagi taught him, but he might not have a choice when all is said and done. Johnny Lawrence has not let the past 30 years go and he's ready to confront LaRusso again. In addition to the new 30-second promo featuring the All-Valley Karate Tournament, billboards have started to pop up promoting Cobra Kai as well. These new billboards promote the reopening of the Cobra Kai dojo and they show William Zabka's Johnny Lawrence with all of the contact info you need to start training with Lawrence and the Cobra Kai. If you call the phone number from the billboard, you get a nice, aggressive earful from Johnny Lawrence telling you what he and the dojo can do for you. YouTube Red is taking the Cobra Kai series very seriously. The previous promo released for Cobra Kai featured a commercial for Daniel LaRusso's (Ralph Macchio) car dealership. LaRusso is clearly doing better than Johnny Lawrence, but he seems like kind of a jerk these days. Plus, he's using some of the moves that Mr. Miyagi taught him to sell cars, which just seems like a bogus move. These commercials run all of the time and only intensify Lawrence's hatred of LaRusso, which should make for a pretty interesting new rivalry now that the Cobra Kai dojo is reopening. Cobra Kai premieres May 2nd on YouTube Red and it looks awesome. Instead of a serious reboot, we're getting a comedy that is taking The Karate Kid mythology in a new direction. Expect more new promos ahead of the May 2nd release date and hopefully some more billboards as well. You can check out the brand-new promo for Cobra Kai below, thanks to the Cobra Kai YouTube channel and then call the number on the billboard that is also listed below to get a message from Johnny Lawrence about the reopening of the Cobra Kai dojo.